The Mars Science Laboratory rover Curiosity successfully landed on Mars on August 5 (PDT), to the thrill of millions around the world who watched in tense amazement as the harrowing landing sequence played out step-by-step exactly as designed, showing that we can safely place a 2-ton nuclear-powered vehicle on the surface of another planet and get photos back within minutes! The images above are the first pics from Curiosity, downlinked literally within minutes of landing. Congratulations to the MSL team at JPL and from all the science instrument teams around the world whose hard work made this happen. 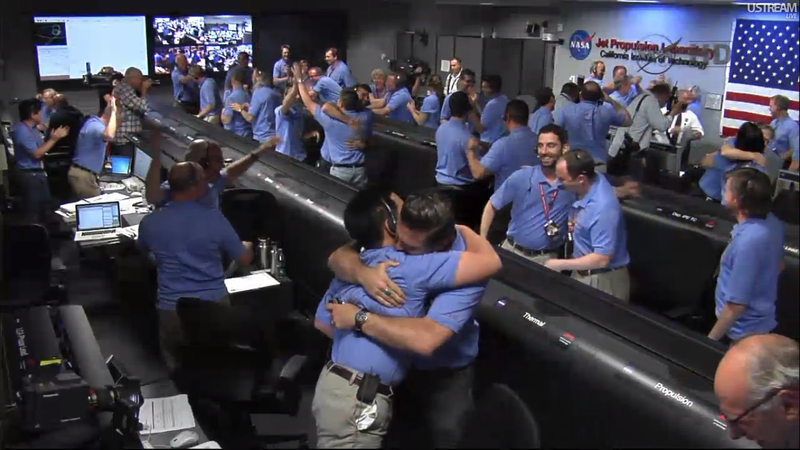 Go Curiosity, go NASA! See the latest images returned from Curiosity here. UPDATE: Here’s a clearer hazcam image from Curiosity showing the central peak of Gale crater, named “Mt. Sharp”, 6.5 km in the distance. 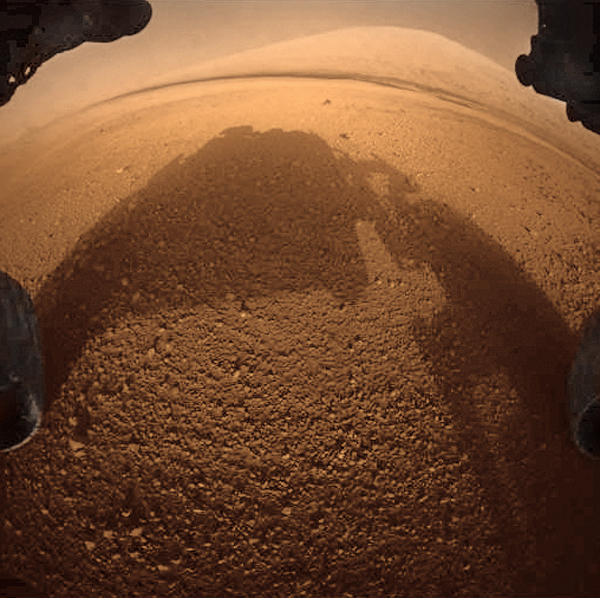 I recolored it to look more “Marsy”, so it’s sorta kinda the type of view we might see once the rover’s Mastcam unfolds and begins taking REAL pics! UPDATE 2: Here’s a REAL color image, the first one taken by Curiosity! 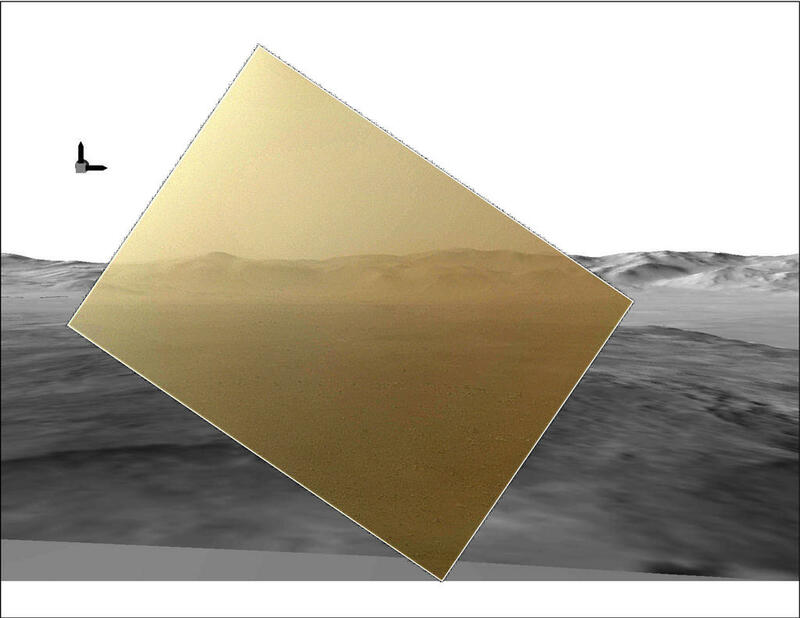 It shows Gale crater’s rim in the distance… beyond a dusty lens cover. The image has been placed into context against a computer model of the terrain. More to come! See more articles on Curiosity’s status here. Great day for exploration!! Held my breath the whole way down! Reblogged this on Spherical Chickens in a Vacuum. How awesome and I hope inspiring. Decision makers need a kick in the tires and hopefully this will provide some political inspiration for those on the fence. What an awesomesauce event! I am sharing this post – I wrote one similar yet different on my blog as well http://edcrossroads.blogspot.com/ – so great to see so many inspired, like-minded people! And now forward for the search(research) for proof that the life existed or exists on Mars ! !